There was more than one Goddess braving the SCV cold in nothing but a toga and a ceremonial grapevine headdress on one recent Friday night. 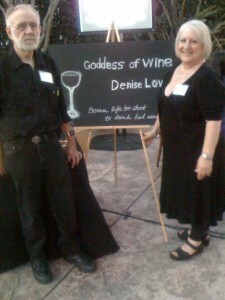 Me, as the temporary Goddess for Circle of Hope’s Vine 2 Wine event in June, and the Goddess of Wine, a fellow-wine blogger, wine educator, WSET Level Two Certified, lucky-for-me-she-lives-in-Burbank-and-can’t-take-my-peeps-home-with-her, buddy Denise Lowe. No, we weren’t really wearing togas. But I can tell you that we both carry waiter’s corkscrews, business cards, notepad and pen, wherever we go. I’ve interviewed Denise before for the Beacon. 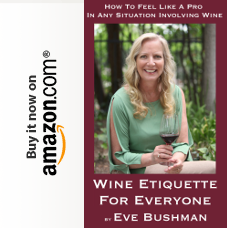 While we both have blogging and the WSET certification in common, she does much more wine education and traveling than I do while I do more writing and marketing than she does. We learn a lot from each other, and we keep each other motivated. She also drives up, with her affable husband John Dickey, “JD”, every month to attend our Grape of the Night meetings. This time, instead of an interview, I invited my pal to visit some of the wine bars in our fair city. As we had taken our WSET classes at The Cellar together, and we attend Grape of the Night at Valencia Wine Company, I tried to squeeze in visits to some the wine bars she hadn’t been to. So, with that in mind, I asked her to come to my house by 4:30 p.m. to get started. (I think she MAY have been motivated to see the new kitchen too!) From my place we drove over to Vino 100 Valencia for a tasting from Toolbox Wine Company that was set to start at 5 pm. And, as I had advertised the event on Facebook, and rsvp’d to a meet-up of “Wine-y Women”, I was sure to run into a few peeps to introduce Denise to. 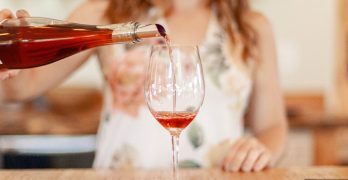 Toolbox Wine Company was created by three Napa Valley girlfriends who share passion and expertise in all facets of the wine industry. 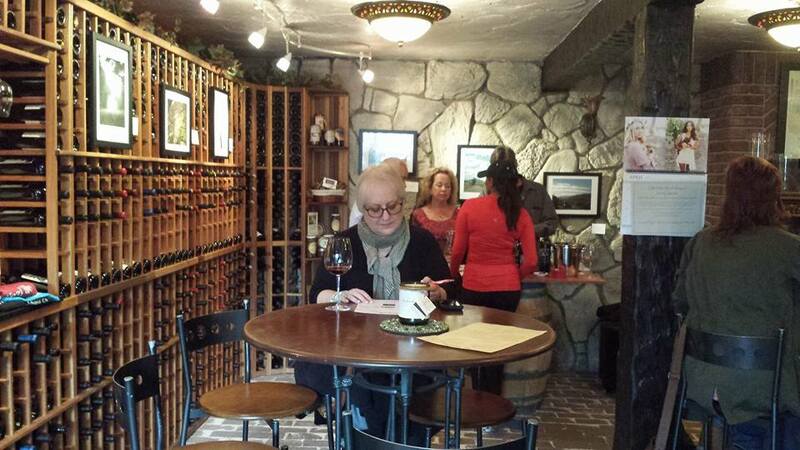 Their vision is to offer excellent (and fun) wines while raising awareness and money for Habitat for Humanity. With their catchy label, they prove that you cannot “judge a book by its cover”. 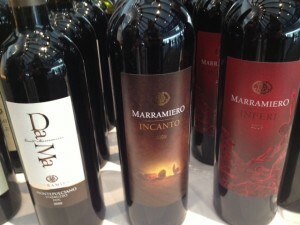 They have successfully produced some wonderful, fun wines that are high quality and affordable. 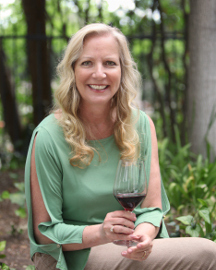 Meet Katie Hamilton Shaffer, co-founder of Toolbox Wine Co., who is looking forward to sharing their story and passion for wine. 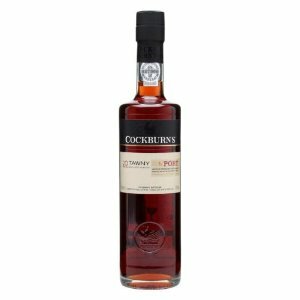 Enjoy tasting several of their newest releases. Light, tasty appetizers will also be served. HOPE YOU WILL JOIN US! 07 Oak Knoll District Napa Valley Chardonnay – Pale honeyed-yellow color, aroma of oak and green apple, with medium acid and a medium finish. 07 Napa Valley Merlot – 10% Cab and 90% Merlot, “Chianti-style” per co-founder Katie Hamilton Shaffer. Very dark edge on the color and opaque throughout, the aroma had tons of black fruit with a surprising blueberry-sweet nose. And the taste was dry, medium tannins with blackberry jam and a medium finish. 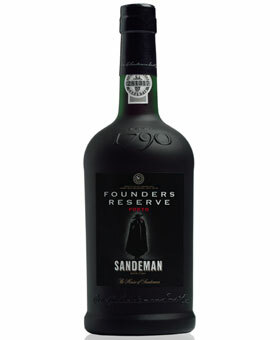 07 Cabernet Sauvignon – Plum color, fresh berries and pine on the nose, ripe berry flavors, dry with a medium length. From there we moved onto Lee’s Wine Bistro for dinner. 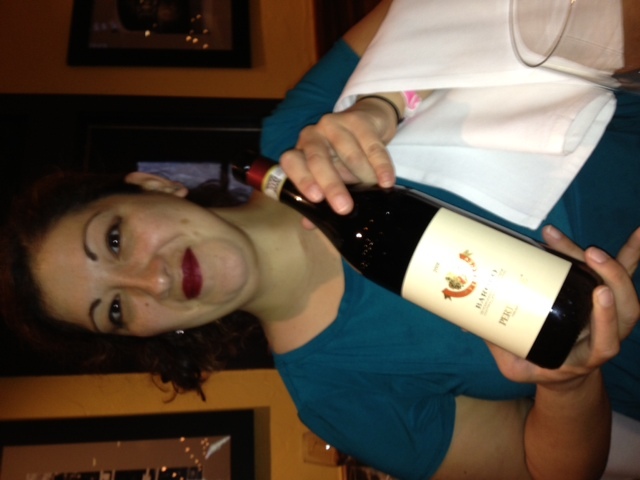 Denise selected a wine that is meant to be savored with a meal: 2006 Villamedoro Montepulciano D’Abruzzo. Owner Lee Yoon was able to come over to say hello and chat, but not for long, as it was soon growing into a busy Friday night. Denise seemed to enjoy the place, as our laughter grew louder and louder to be heard over the music and other guests. From there I drove across the street to Wine 661 to introduce Denise to Tanya Green, the owner, and to computer whiz Tony Wire, her boyfriend that is always at her side. Now it was time to order a wine by the glass, as we needed to slow down. We both had a blend by Trinitas Cellars in Mendocino. 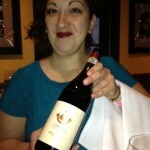 And, true to form, Tanya swirled the wine she poured into our glasses, making sure that our wine was ready for tasting. I also requested Tanya’s spa water – iced water infused with fresh cucumber – to cleanse our palates, and, eventually, move us Goddesses over from wine to water. 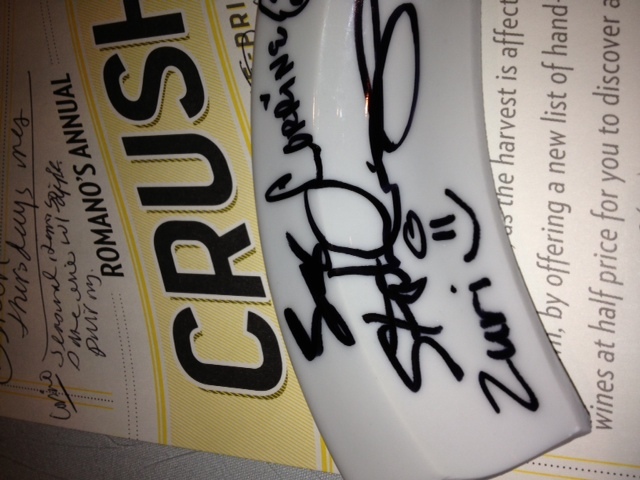 As we sipped and listened to the band, four last peeps made their entrance and met Denise. Tim and Erin Dixon, and, Mark and Ann Drexler, had stopped by to purchase a bottle to take home with them. Funny, Denise lives in Burbank, as I mentioned earlier, and we have more wine bars in one small area that she does in her big city. It’s a wonder. Or, is it just our growing infrastructure, or demographics, meeting our needs? It doesn’t matter. When it comes to wine, it’s all good for Goddesses. *Easy Going is a tour where no athletic training is necessary. Suitable for tourists of all levels and children (10yrs+). No dangerous downhill or steep slopes. **Intermediate/Medium is for the weekly rider who cycles 2-3 times a month covering distances of 20-25km with a slope not higher than 500 meters. A minimum of training is necessary. This tour has been created for Mountain Bike enthusiasts and lovers of outdoor excursions. ***Hard Going is a tour where some light training is necessary. It is for the active rider who cycles once or twice a week, covering distances of about 35-45 km with slopes of about 1,000 meters. This tour is tailored for trained people, mountain bike enthusiasts and lovers of outdoor excursions. TWB is a complete wine tasting and culinary biking tour experience created by local freelance oenologist and Winemaker Carlo Travagli. Led by Travagli and cycling enthusiast Luca Casini, the tour treks on mountain bikes across the provinces of Siena, Firenze, Pisa and Pistoia through the historic and scenic Chianti Wine Region of Tuscany, located on the Central West Coast of Italy. TWB has developed a biking tour designed to capture and uncover the most authentic aspects of Tuscany, often missed and overlooked by visitors using conventional means of transportation. TWB provides participants with everything they need to explore Italy’s most renown wine growing region including all equipment, expert guides, oenologist guided wine tasting, meals provided by regional partners, varied itineraries catered to both conditioning level and interests of the participants, round-trip pick-up service, optional lodging, technical support and emergency recovery service, and insurance. 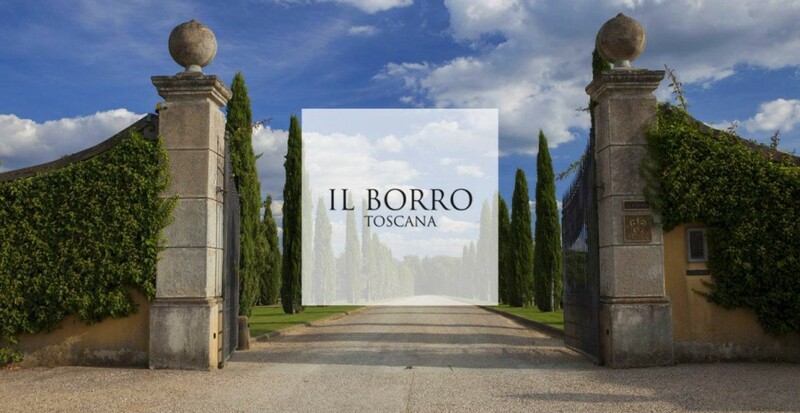 For more information, visit the Tuscany Wine and Bike website. To keep up with the latest TWB activities and special offerings, register for their newsletter, join TWB on Facebook, and follow TWB on Twitter. Email TWB or call (+39)333 9206700. 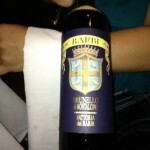 Not Stuffy + Surprisingly Great Wines = Romano’s Macaroni Grill Valencia! Who Knew? “Finding an organization that has a passion for people,” began assistant manager and unadvertised wine expert Corrine Ramirez. 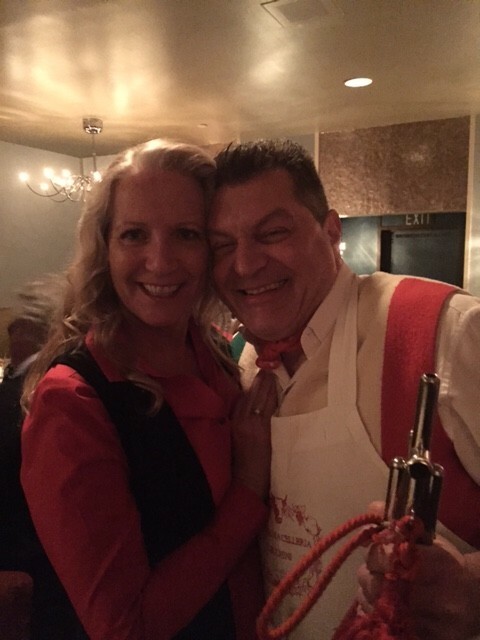 “People either go out for an experience or to wind down after work.” Whatever your reason Corrine believes that employees that “do their job from the heart” will easily please the customers. 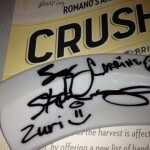 It started like this: SCV Wine Enthusiasts’ Douglas Gould wanted to meet me at the local Macaroni Grill to try the new “Romano’s Annual Crush” wine menu. I had no idea there was such a thing, nor did I expect to be amazed by it…and to be brutally honest, the last thing I expected is exactly what I got: Savory foods through to creamy desserts paired with some amazing (mostly) Italian wines AND employees definitely doing a job from their collective hearts. As far as the restaurant’s wine program, I learned from Corrine that the managers received weekly emails with a full page of information on various wines, similar to what you would find on a winery website, that includes information on the varietal, vineyard, aging, tasting notes and pairing selections. This information is then posted in each restaurant, and discussed with the servers. Paired with Scallops, some squirted with lemon and some without, I was met by aromas of kiwi, creamy cheeses…and the flavor of peaches in balance with the acid with the food. Nice, crisp acids, followed by lemongrass and pear. Aromas of plum, black licorice, earth and spaghetti sauce (I swear I didn’t smell that in the restaurant!) followed by a mouthful of abundant blueberry, some bark and cigar. Served with thin slices of Chianti spicy sausage, the fennel in the sausage “popped” when I tried it with the Barolo. The wine had great spice, red fruit and was palate-drying. 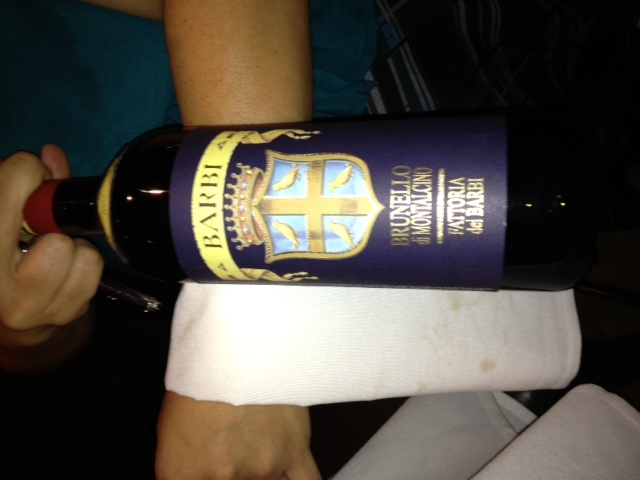 A perfect Brunello di Montalcino…with blue fruits, earthiness, smoke, plums all balanced well against the tannins. We paired it with the Italian Bake – a dish of meatballs, a different spicy Italian sausage, rigatoni noodles and ricotta cheese. I could have had that all day…but instead dessert beckoned. I liked this a lot with the Lemon Cashew Cake. The wine had honey, mango and sugared ginger on the nose and a beautiful mouth-coating viscosity and flavors of Hawaiian sweet pineapple. Without the dessert, the sweetness hung in the mouth like a juice piece of ripe fruit. Vino California (www.vino-california.com) is a week-long wine and food celebration of native Italian wine. 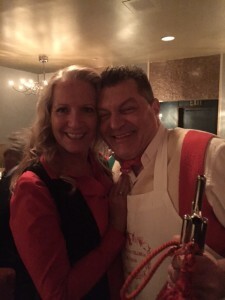 Sponsored by the Italy-America Chamber of Commerce West Inc, Blue Lifestyle, and The Tasting Panel magazine, this year the festivities started on May 13th and continued for five days with a series of tastings, seminars, and wine dinners. I had the pleasure of attending the trade/media portion of the grand tasting held on May 14th at the Skirball Cultural Center. Many of you in the Santa Clarita Valley, especially those who frequent the wine bars, may know Robert as a great guitarist and singer, currently as a member The Keys. 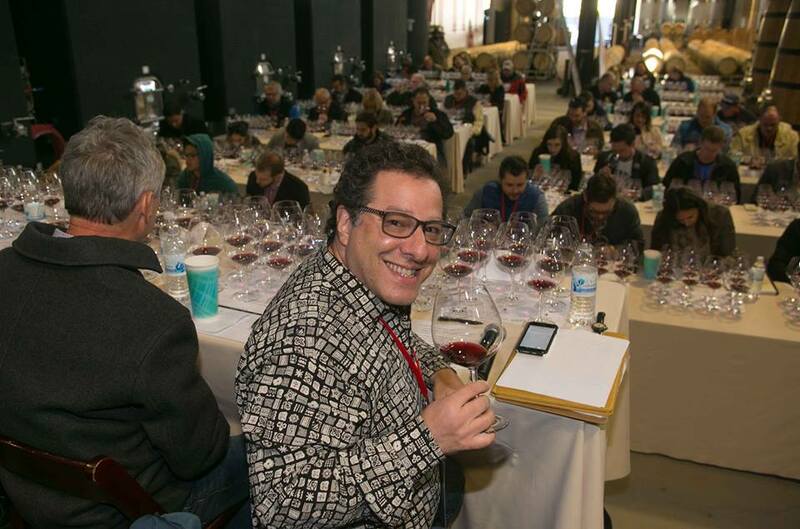 You may not know that Robert is also an Italian wine expert, and works with Italia Wine Imports to supply some of the great Italian wines you can find in our local restaurants and bars. A brief discussion with Robert, in which he shared his passion for Italian wines as well as his recommendation for wines I absolutely had to taste that day, helped to get things started right. All the above are 100% Montepulciano. The above list does not do justice to the amazing wines I tasted that day, as well as the other I-am-sure-equally-amazing wines that I did not get to. I ended my afternoon of tasting back at Robert’s table to try the grappas he was pouring. 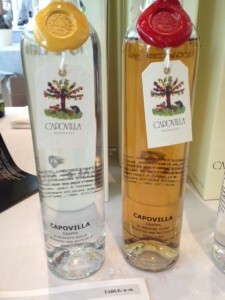 I loved both of them from the Capovilla Distilatti SRL based in the Venuto Region. The Grappa Di Moscato Giallo was made from 100% Moscato Giallo Pomace and the Grappa Di Amarone Legno was blend of Corvina, Molinara and Rondinella Pomace. I couldn’t agree more. There are so many great wines out there and it is a good idea to spend some time out of your comfort zone. Having a guide like Robert is always a great help, but even if you are on your own, the best way to learn about wine is to taste-taste-taste!